The plant you will receive is growing in a 3" pot Very easy to grow, can also be kept in containers Fruits are edible Flowers begin in Spring and the vine will flower on and off for most of the Spring and Summer Easy to grow. PASSION FLOWER: Passion flowers are exotic looking topical plants that can actually be grown in much milder areas. There are many different passion flower plants. 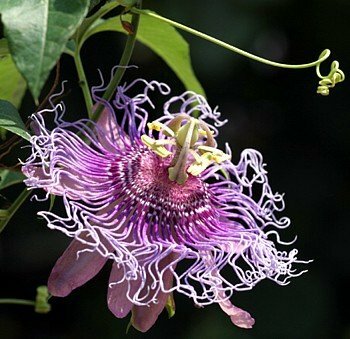 Some passion flowers are vines, some produce edible fruits. The genus Passiflora contains over 400 species. The name 'Passion' Flower comes from Spanish Christian missionaries who adopted the unique physical structures of this plant, particularly the numbers of its various flower parts, as symbols of the last days of Jesus and especially his crucifixion. Very fast growing vine to 10-20 ft, sometimes longer. This variety is a hybrid between two hardy passion flower species (Passiflora incarnata and P. cinnicata), and as a result, is very hardy itself, surviving temperatures below 0 F. Vines will die back upon temperatures below 32F but will regrow from roots when the weather warms up again. Grow in full sun or part shade, keep watered throughout the growing season. Flowers begin in Spring and the vine will flower on and off for most of the Spring and Summer. Flowers attract birds (including hummingbirds). Flowers are followed by yellow, 1-3" fruit with little pulp. Fruits are edible. Very easy to grow, can also be kept in containers.